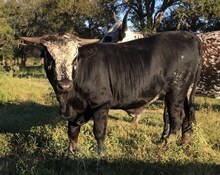 This dazzling young gal was raised by Varner Farms and purchased from Rocking O Longhorns. 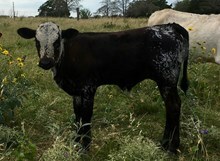 Her beautiful face and flashy black and white speckles caught our eye but her twist genetics and solid pedigree closed the deal. 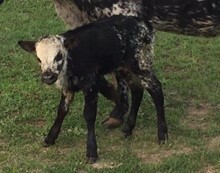 Her black tipped horns are twisting hard so they've had a slow start but they have finally started to go boom. She will be a traffic stopper and is showing excellent mothering skills. Horns are going to have long black tips with very unique twist- just look at her dam. Her calves are always flashy and stout and just like Ms. Varner, she's a sweetie to work with.